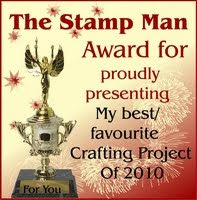 Welcome to our main Stamp Man blog where we will be hosting our future challenges. The challenges will now be held monthly from the 1st until the the last day of the month. We are also changing the way our design team work on the themes and we will be showing their work throughout the month rather than all at the start of the challenge so do call back to see their projects as they are added. 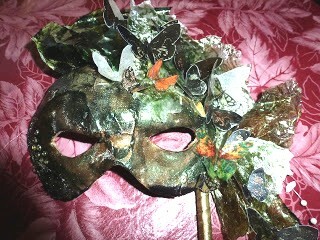 The theme for this challenge is Butterflies, Birds and Bees. Tim Holtz Papilion stamps, Vellum and tissue paper, Clear Embossing powder, Moonglow Embossing - Dessert copper pine, Obsidian Violet, Black archival ink, Tim Holtz Embossing ink - Mustard seed, Dried Marigold, peeled paint and walnut stain, Napkin collage kit, green gems, paper mask. 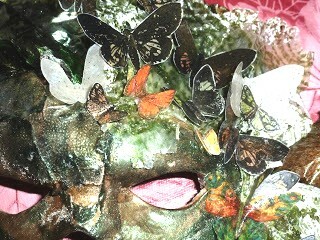 The butterfly from that stamp has been stamped onto vellum which was tinted from behind with Solvent pens. The background was made using Adirondack dye based ink and ink dusters. 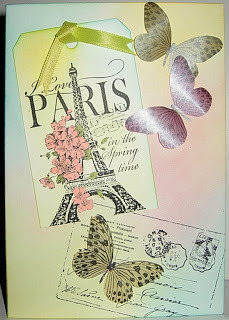 The flowers on the Paris Tag (cut with a TH die and then shortened, the arch at the bottom of the tower has also been cut out with the flowers left trailing) are also coloured with solvent pens. I used Momento black for my stamping including on the vellum. 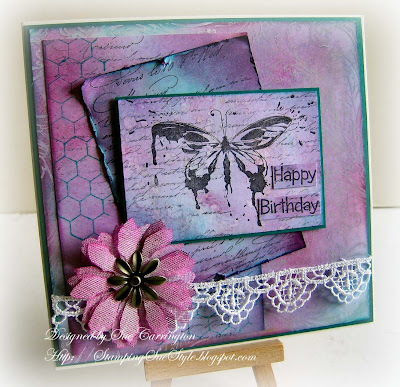 Do visit Sue's blog for more details about her gorgeous card! Please continue with our challenge rules as before, if you are new to the challenges, then please read our rules, just click on the Challenge Instructions page at the top. Thank you for joining us with the challenges in the past and we hope you will continue to join us. 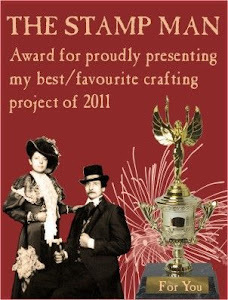 Excellent, I made a piece for the summer sizzler - hot olours but missed the closing by a day, at least now I'll know how long I have to create a post. I'm looking forward to joining in! 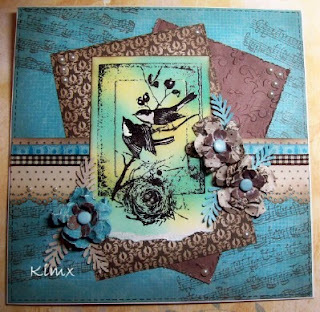 Gorgeus card and wonderful use of stamps and colors. Just uploaded my tag, it's my first time playing along with you and I'm already looking forward to next month. Such beautifully colored inspirational pieces! Love the ideas, and other artists' uploads. Am your newest follower. Thanks for the challenge! First time I've played with you. 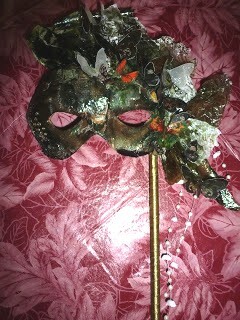 Love the DT inspiration - thanks for sharing! Great challenge and fantastic examples. 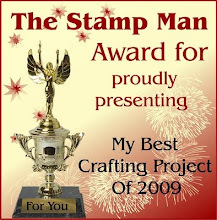 Wonderful blog.... lovely to be able to take part! Woo Hoo.... Look what's NEW!! !